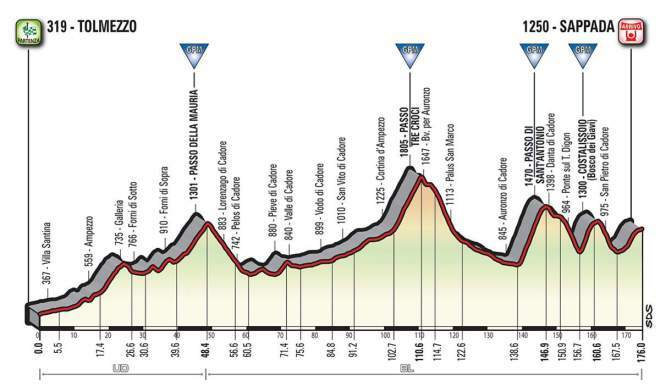 It is a high mountain stage in the Dolomites with 4 categorized climbs, none of which very hard or too easy. In particular, past Auronzo di Cadore, the stage takes in two new climbs of Comelico (Passo Sant’Antonio and Costalissoio) with gradients almost always above 10%. Final stretch slightly uphill. The finish is located a few hundred meters from the finish in 1987, when Stephen Roche claimed the first maglia Rosa of his “Giro-Tour-World Championships” Grand Slam that year, a feat that only Eddy Merckx managed to make in 1974.